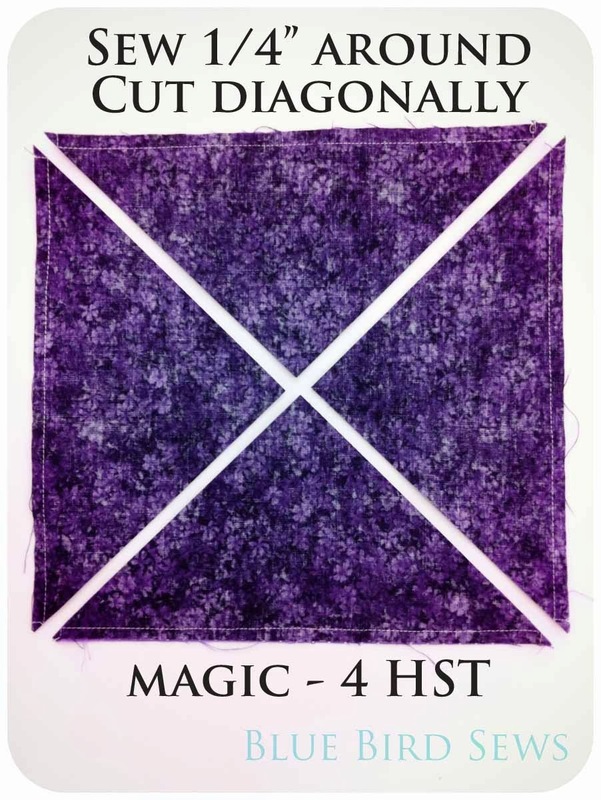 Hello again and welcome to the second week of Quilting with Me where we talk about cutting and constructing all the half squares triangles (HST). And let me tell you, my brain kinda hurts because of it. When I make quilts it is from scratch in my head with a few roughs sketches and measurements. And most the time they are not on point. Toying around with settings has been on my quilty want to list for a bit. A block can change so much when you flip it 45°; a little magic happens in that spin. 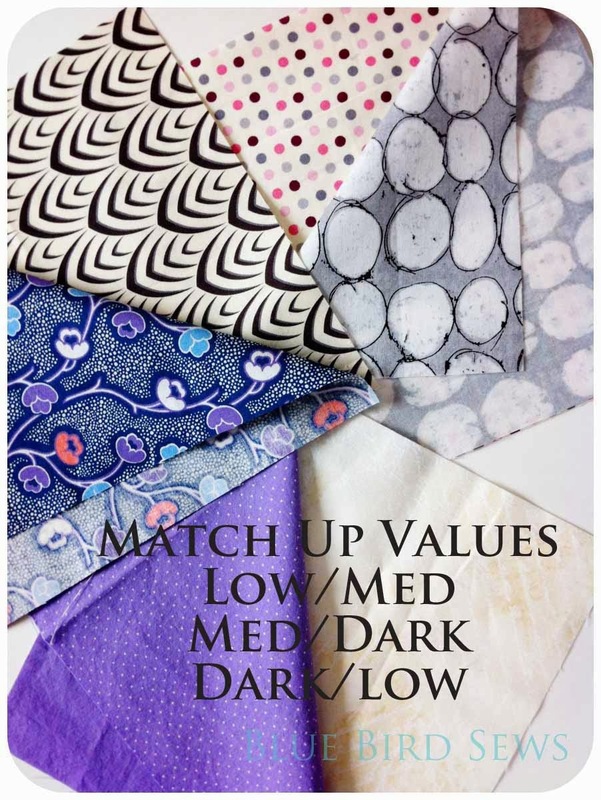 Turns out magic takes some math but luckily there are a whole lot of resources out there to help a quilter navigate the numbers. I learned about side setting triangles and what math to do for them. These are the triangles that fill in around blocks when set on point. I will not attempt to explain or say I fully understand it. I just plugged in some measurements, tried out a block, asked my mates at PMQG what I was doing wrong, then I went back to the sewing machine, made a tweak and Bam. Side setting triangles figured out, kinda. I wrote some stuff down and it works, how it works? Magic. 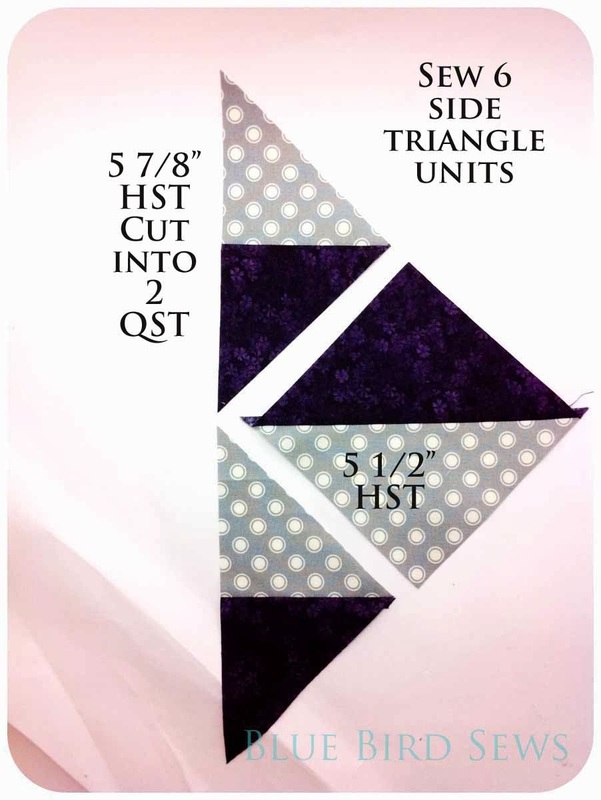 I learned a couple of really great techniques for HST making and trimming from the on-line quilt community. It has changed my world! 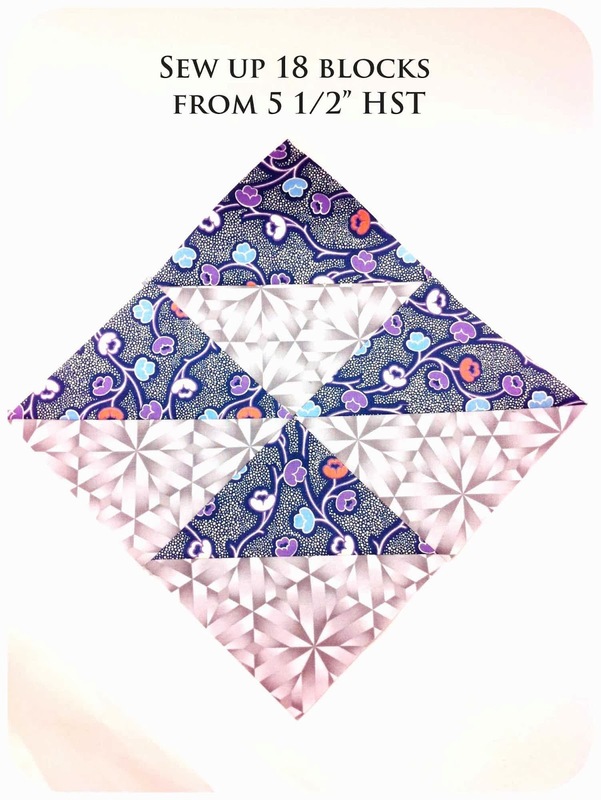 The first is making HST four at a time and I used a tutorial from Christina Lane, The Sometimes Crafter, posted as a guest topic at Whipup. 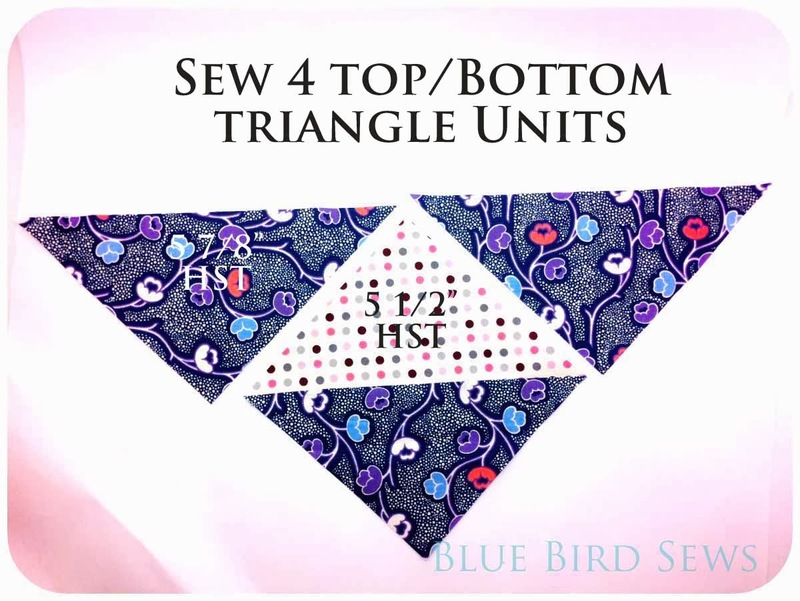 The method she describes is so simple and elegant, yielding 4 HST from two squares sewn together. 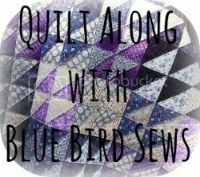 The second little trick I found is by Amy Smart, Diary of a Quilter. She stumbled upon the way to use an HST ruler from Quilt in a Day; which I happened to have already! With the ruler you can trim HST before opening them up for pressing and having to only cut once to trim! Yay! 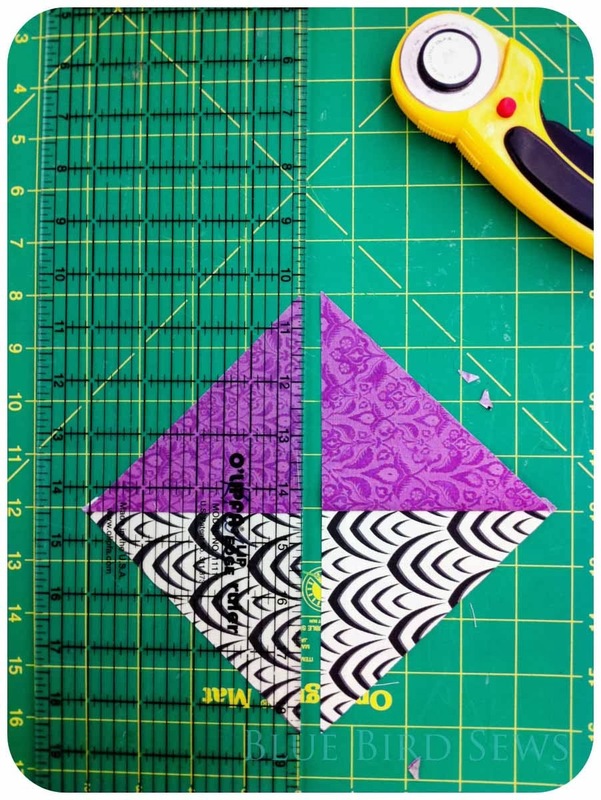 Check out both of these great techniques then come on back for fabric measurements and all the mathy goodness you can handle! Hello, are you there? Oh wow, I almost blanked out typing all those up...... boring! Let's do the same sorta thing but with pictures and diagrams. So much better! First up cut out squares for HST. Then sew around each set of squares to create 4 HST. 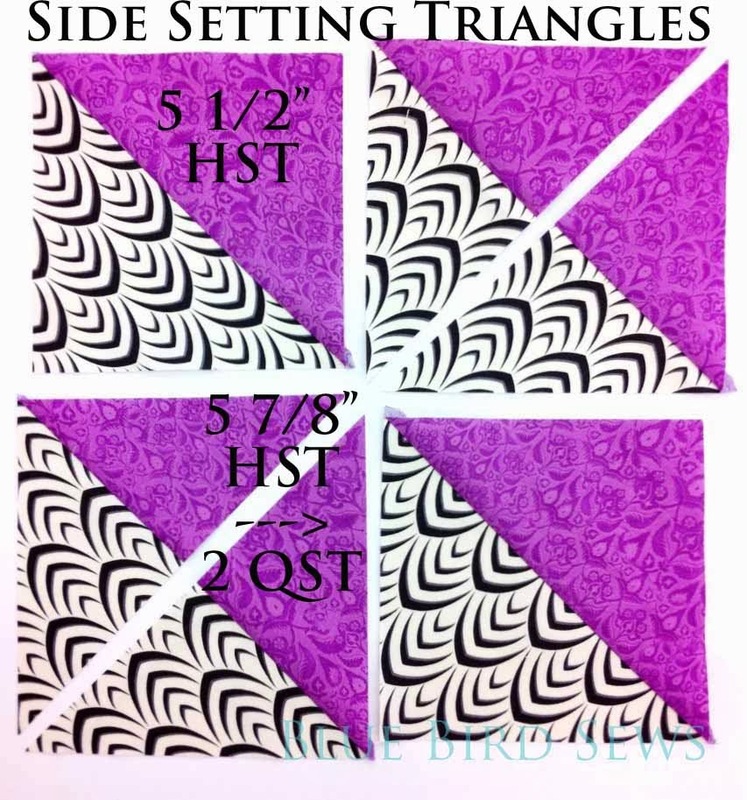 First the easy ones: Center 4 Blocks from 8 1/2" squares ---> 4 HST Trimmed to 5 1/2"
Top/Bottom Triangle Units - Top and Bottom units use 1 - 5 1/2" HST and 2 - 5 7/8" deconstructed HST. Once HST are trimmed use your seam ripper to deconstruct the 5 7/8" HST and use them to sew up the top and bottom triangle units. 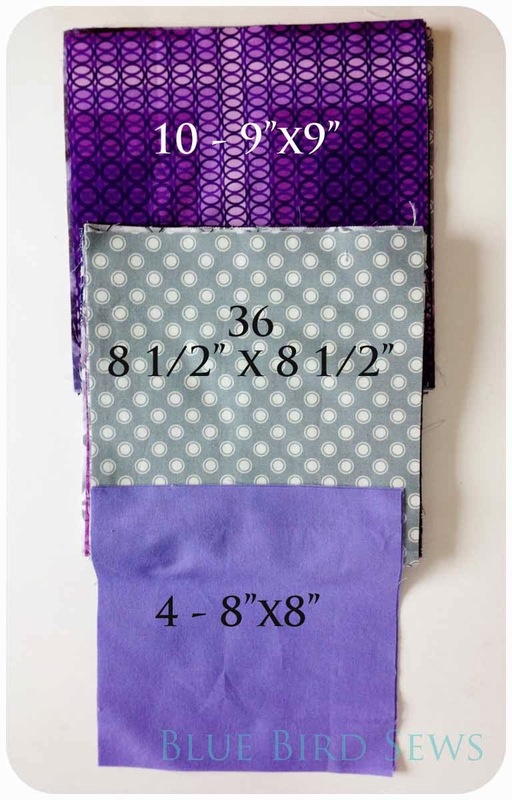 Okay there are all the units you'll need to sew up this quilt! Pretty straight forward right? If you have any questions please leave them in the comments and I will answer them there so we can all see what's happening. Also share these with us! Tag them #bluebirdsewsQAL on IG or add them to the Flickr page. I can't wait to see what you all are sewing! Next week I'll talk about how to sew the units together into rows and the a quilt top. That part is super easy! We're almost done with this quilt top! Hooray!